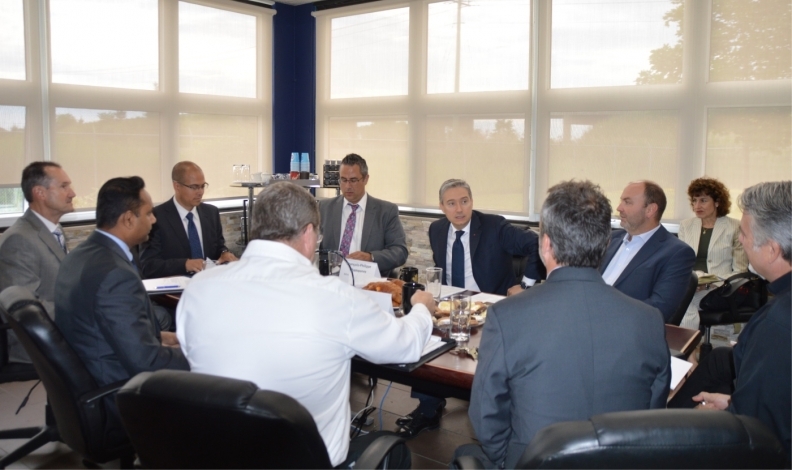 Federal International Trade Minister Francois-Philippe Champagne, centre, meets with representatives of the Canadian Association of Mould Makers and other auto- industry stakeholders. Canada’s auto parts suppliers can bolster their defences against U.S. protectionism by conquering new markets in Asia and Europe, former federal International Trade Minister Francois-Philippe Champagne said before being shuffled out of cabinet last month. for other opportunities as barriers are moving down [in Europe and the Pacific Rim],” Champagne said at a recent meeting with the Canadian Association of Mould Makers (CAMM) in Windsor, Ont., before Prime Minister Justin Trudeau made changes to his cabinet. The minister invited the group to be part of a trade mission later this year to countries covered by free-trade deals, including the Canada-European Union Comprehensive Economic and Trade Agreement and Comprehensive and Progressive Agreement For Trans-Pacific Partnership (CPTPP). Similar trade missions have helped exporters in other Canadian jurisdictions, such as British Columbia, diversify their customer base, Champagne said. However, the minister’s pitch generated little enthusiasm among a group of businesses, more concerned with ending uncertainty over stalled talks to renegotiate the North American Free Trade Agreement (NAFTA) as well as surviving the escalating U.S.-Canada trade war. Brendan Sweeney, project manager at the Hamilton, Ont.-based Automotive Policy Research Centre, said parts suppliers, particularly Tier One, Two and Three companies, have good reason to be skeptical about accessing farflung markets. “It would be difficult for Ontario mould makers whose businesses grew up around NAFTA to all of a sudden expect they could drum up a lot of business in Japan, which has developed its own industry,” said Sweeney. “If we spent all this time trying to increase our business by two per cent with Vietnam or Korea or Japan at the expense of reducing our business with the United States by 10 per cent, that’s not a good strategy.” The European market offers more potential, but is still fraught with risk, said Sweeney. Azzopardi stressed the importance of preserving NAFTA, particularly to a region that exports at least 70 per cent of its manufactured goods to the United States. A new NAFTA deal isn’t expected until after November’s U.S. mid-term elections, however Azzopardi said there is common ground, citing consensus among the three NAFTA partners to raise origin-of-content rules for vehicles to 75 per cent from 62.5. While Champagne tried to reassure the group that Ottawa was battling the trade fight on all fronts, Azzopardi said suppliers were already sustaining collateral damage in the form of rising production costs as well as lost contracts to U.S. competitors.